I cannot remember the exact moment in my life when I responded to art. Certainly, the beauty of stark simplicity and things made by hand were givens in my childhood: the bright, patchwork quilts, the thick, braided wool rugs, the jewel-coloured jars of home-canned fruits, jams, relishes and sausages, the vases of flamboyant flowers against a bare, white wall of my Mennonite home – these were some of the moments when I responded to art early on in life. Back then, I had all the time in the world to walk around and stare. Just how I jumped from these early sensations to becoming a painter, I don’t really understand myself. I had a little box of paints that my brother had given me. Just seeing the clean, shiny colours, smelling the turpentine, and feeling the spring of the brush hairs thrilled me. I started looking at the world differently, dividing everything I saw into little blobs of paint. I am very honoured to be part of such a great painting tradition, one that stretches back 15 thousand years to the cave painters of France and Spain. It warms my heart to think that we humans still come together to celebrate the act of making marks, one by one, by hand, especially today when computers can make thousands of pictures for us instantly in any style and colour. Art exhibits remind us that we are not machines. Each little brushstoke made by a human hand is crammed with information about what it is to be a particular human being. No wonder ancient civilizations thought that art carried magical powers. And just maybe it does. After all, angels always seem to pop up whenever I go out painting. I was shivering one cold autumn day while painting on the front stoop of an old house. I thought no one was home. The door behind me creaked open and someone dropped a warm shawl over my shoulders. A few weeks ago, I drove past Tally Ho in Hillside on hwy #60. I have always loved the view of the big garden and the small bight cabins under the big trees. Since I had my easel with me, I pulled over to the side of the road and set it up, squeezed out blobs of paint, and was all ready to go, when I realized that I didn’t have any turpentine. Well, you can’t paint oils without some thinning agent. At that very instant, a car drove up behind me – the owner of Tally Ho. She put a call into housekeeping and within minutes, another car drove up and handed me a jug of turpentine. Last month, I set up my easel by some unused railway tracks in a rough end of Port Colborne, my hometown. I was deep in concentration when I heard the flatulating engine of a passing Harley Davidson suddenly stop. Out of the corner of my eye, I saw a leathery, tough-looking dude, heading right for me. “What are you doing here?” He yelled at me. He was right. I hadn’t noticed before. I was even standing in it. The beauty if the starkness of the houses had absorbed all my interest. After a good long look at the painting, he burst out laughing. “Sure. Go ahead.” I answered, wondering who THEY were. “Thanks, he said, “You know, you’ve made my day. “Thank you, Sir. You have made my day, too,“ I answered. Away he went, muttering to himself something about finding beauty in the strangest places and I went back to my painting, smiling inside and out. The challenge for the painter in Muskoka is not the sifting through garbage to find beauty, (at least not yet). Rather, the challenge is to sort through a surplus of jaw-dropping beauty, ever changing landscapes, to find the little unexpected nugget that, on canvas, will say just enough of what I found to be important about the whole majestic scene. It is very important to have local, original art hanging in a public library which is dedicated to another form of art – the written word. Since a picture is worth a thousand words, books and visual art are a splendid team that speak truth in different languages. In fact, it was from literature that I took the title for my show – a poem by Lord Byron entitled, “She Walks in Beauty”. You walk in beauty, too. The many exhibits that will pass through this library will help you to develop the vision to recognize it – the beauty of nature, the beauty of the commonplace, the beauty of the abstract, the beauty of the ugly, the beauty of the unexpected. Painting is a lot about seeing. One of my teachers was Bill Schultz. His teacher, Brachman, was a student of the great American painter, Robert Henri, who wrote, “Art in the community has a subtle, unconscious, refining influence.” With art hanging on its walls, the library will become the life-centre of Huntsville from where powerful, stimulating ideas and discussions will radiate, just as Henri predicted of art schools. I thank the show curator, Mary Rashleigh and head librarian, Debbie Duce for having the vision to create this venue for artists to communicate with the public. It’s a great privilege for me to be the first to have my say about my little slice of life and my impressions of it. Thank you to musicians, Josh, Graham and David and a heartfelt thank you to everyone for coming to look at my paintings and to share this celebration with me. 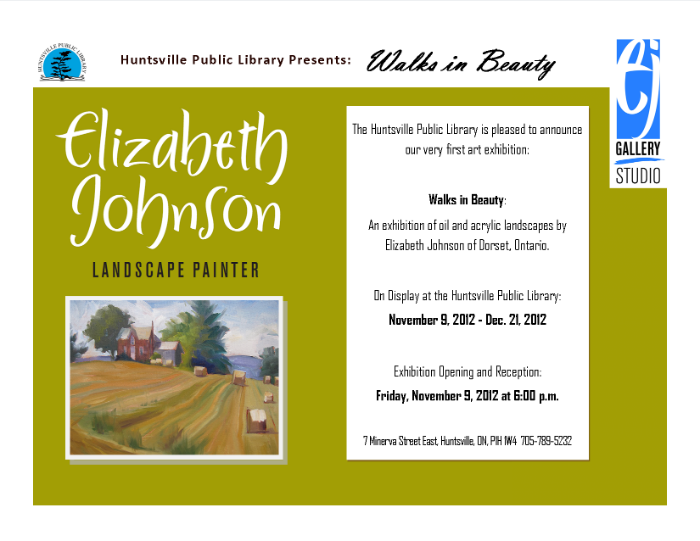 I invite you and your friends to the opening of my art exhibit, “Walks in Beauty,” at the Huntsville Public Library, Huntsville, Ontario. The grand opening is next Friday, November 9, 2012, at 6:00 p.m. If you can’t make it then, the exhibit runs until December 21, 2012.